Minimises the space required behind a display panel. AMALGAMATED Instrument has released two-wire, loop-powered indicators that have been designed to minimise the space required behind a display panel. A depth of 75mm from the front of the panel accommodates the indicator and associated wiring. The PM6-LP-4C’s display can be scaled to read in engineering units without special tools or test equipment. Two remote inputs can each be programmed to provide a display hold, a peak hold, a maximum or minimum function. The display is a four-digit, 12.7mm LCD. 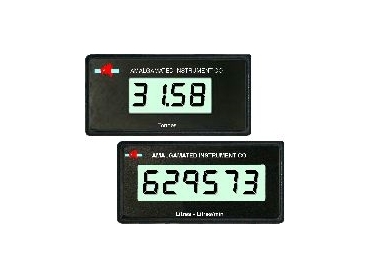 The PM6-LP-6C is a six-digit process display that can also be configured for rate and total functions from the 4mA-20mA input. The display can be scaled to read in engineering units. Different engineering units can be displayed for rate and total. It can be configured to display L/min for the rate display and kL for the total display. The six-digit model also has two remote inputs to enhance its flexibility. The remote inputs can be set to the same the functions four digit model plus a clear total function. The display is a six-digit 12.7mm LCD. The displays offer programmable high over-range or low over-range indication. The indicators can be programmed to flash the display with the value or "_or_ " when the indicated value goes above a configured value or below a configured value. These values need not be set (the functions can be turned on or off independently). This provides a visual indication of a situation that may need attention. These loop-powered displays have a 96mm x 48mm bezel (standard 1/8 DIN) and require a cutout of 92mm x 44mm. A clear plastic access cover is available to provide IP65 environmental protection if required. The units are suitable for situations where a standard-depth panel cannot be accommodated. Both displays are powered by the signal loop and require no other power input. They can function on a 4mA-20mA loop or a 10mA-50mA loop (user-selectable).